Hydroxyapatite (HA), a bone mineral-like material, has been extensively used in bone related research fields, such as osteoporosis, bone matrix mineralization, tissue calcification, and bone defects repair. Osteoblasts, osteoclasts, and stem cells have been frequently cultured on HA surfaces to study their proliferation and differentiation behaviors for drug screening and bone regeneration purposes. HA discs are individually packaged and terminally sterilized using γ-radiation. They are ready to use! 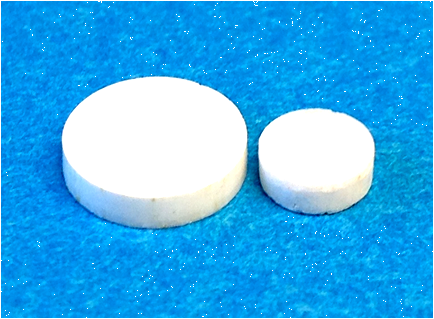 HA discs are made from 100% synthetic hydroxyapatite with consistent quality to ensure experimental reproducibility when using different batches of HA discs.